If I had a nickel for every charity or nonprofit that claims to give “a hand-up instead of a handout,” I’d be a wealthy man — and I’d donate a lot of those nickels to a nonprofit that actually does provide a hand-up instead of a handout. The phrase “hand-up instead of a handout” too often has meant nothing and has become rather cliché — and that’s a shame because it’s at the very heart of what we do at The Fuller Center for Housing. That’s not how it works. For new houses, homeowner partners must be working hard to provide for themselves even if they fall just short of what they need to qualify for traditional lending from banks. They must perform hundreds of hours of “sweat equity” in the building of their homes and then repay the costs of materials, over time, with zero interest charged on mortgage terms they can afford. This allows them to pay it forward as the money goes into a Fund for Humanity to help others in their local community get the same hand-up. For smaller repair projects, there is the Greater Blessing program. There is no mortgage involved in repaying the costs of repairs, but homeowners are asked to contribute “sweat equity” alongside our volunteers and are asked to repay the costs as they are able. For many of the seniors and disabled with whom we work, this may mean just a few dollars at a time. We find that even though they aren’t legally required to repay the costs, they want to. Perhaps that’s out of pure gratitude, a sense of pride, or a combination of the two. That hand-up can even lift the recipient far beyond the home itself. One of the best examples of this is Ana Tarazona Ramos in Peru. She struggled daily to get by on the streets of Lima, moving from rented room to rented room with her three young children at the mercy of unscrupulous landlords. She often wondered where their next meal would come from as selling school supplies on the streets did not provide an adequate living. Then she heard about The Fuller Center’s growing community in La Florida. 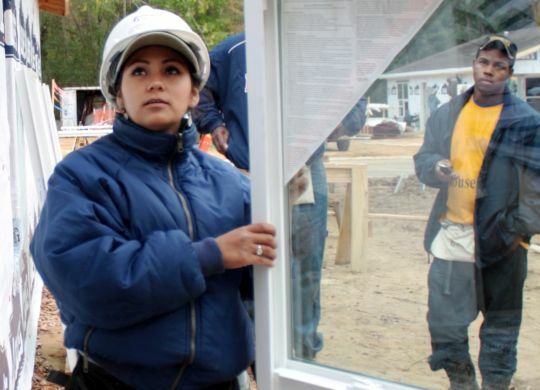 She hopped a bus in desperation and wound up partnering with us to build a home for her family. She was so grateful for the hand-up that she even came to America in 2011 to help others build homes at the Millard Fuller Legacy Build in Minden, Louisiana. With her children having a stable life and excelling in school, she felt empowered and rediscovered herself. She would go on to be elected mayor of La Florida. I heard her tell her story directly to our Board of Directors during that Legacy Build. She fought through tears of joy and gratitude to explain how the hand-up changed her life and why she came to the U.S. to pay it forward. There wasn’t a dry eye in the room. My friend Thad Harris, meanwhile, epitomizes what a hand-up can do perhaps more than anyone I’ve ever met. 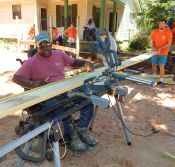 Years after being paralyzed in a traffic accident that cost him his livelihood as a construction worker and sent him spiraling into a depression, he partnered with The Fuller Center to build a new home in Americus, Georgia, a few miles from our headquarters. Not only did Thad perform hundreds of hours more than his required sweat equity from his wheelchair, but he has since become one of our most prolific volunteers with the local covenant partner, of which he also is a board member. On top of his usual volunteering, he spends weeks each year leading U.S. Builders teams who come to work in Americus. Thad’s smiling face is the main thing they remember about their trips here. There is a time and a place for handouts, such as in the immediate aftermath of a disaster. But, too often, handouts are diminishing and counter-productive. When we first began working in Haiti after the 2010 earthquake, we found a culture of dependency that had been created and exacerbated by decades of well-meaning handouts from the United States. We can’t change the entire culture of dependency, but in the areas where we’ve built more than 200 permanent homes, our homeowner partners have been our co-workers instead of charity cases. They are proud of their accomplishments. And they set an example for the Haitian people around them that shows how empowering a hand-up can be. When you support The Fuller Center for Housing, you are truly extending an empowering hand-up instead of a diminishing handout. For that, to echo Thad’s sentiments to us, we are so thankful and want you to know you are appreciated.